When I was first considering making some scenic trees, I realized that model railway enthusiasts had been doing this for years. At a train hobby exhibition, I picked up a number of modelling ingredients and set to work trying to learn and reproduce the techniques and outcomes that the model railway folks had long had under their collective belts. 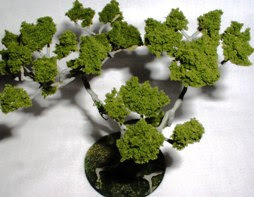 So, something a little different today: this article presents a tutorial on how to make scenic trees like the model railway enthusiasts. I think the results should be achievable by almost anyone reading this (if you're young, though, I'd recommend getting a grown-ups help). Enjoy! 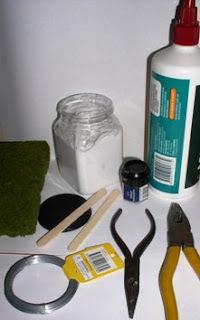 wooden ice-lolly sticks (to be used for mixing and applying the filler; an old, large brush that you don't care too much about would also suffice). Step 1. Grab yourself a whole bunch of wires. About 14 would be quite sufficient to make a decent sized tree with. (edit: I've used lengths of about 40cm in the pictures, different lengths will affect the height of the final tree). Feel free to experiment with larger numbers for different effects (e.g. thicker trunks). Straighten them out if you bought them curled up in packaging (e.g. from necklace making supplies). Step 2. Fold your wires in half. The top of the loop will become the tree's branches, the ends will become roots. (Folding them in half is not strictly necessary, it simply creates a thicker trunk to work with. By not folding them in half, you'll have taller and thinner trees). We're now going to twist the wires together to define the trunk. You need to decide now how much root-work you want. I'm going to twist (using the pliers) about 1/3 of the way up from the non-loop end. If you want lots of roots to play with, choose a twisting point nearer to the centre. If you want more branches to play with, choose a twisting points further towards the (non-loop) end. Unless you're planting your tree in styrofoam, you'll want to have at least some roots to provide balance for your tree. You'll want in the region of at least 2cm of twisting for the main trunk. Step 3. We're going to work on the branches now. If you look at real world trees, you'll notice that the trunk and branches usually split in two (or bifurcate) with increasing height for the most part. So, divide the loops above the trunk section in to two groups. 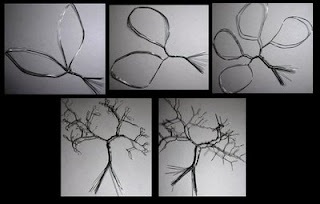 These groupings don't have to be even numbers of wires at all - you can create some interesting trees by using (say) 8 in one group and 17 in another. For each of these two loops, twist once more. You've now made two main branches coming out from the main trunk. Step 4. You should continue with this splitting in to groups and twisting process (as pictured) until you've run all the way up to the tip of the wire loops! (The tips will be holding the clump foliage later on, so you might want to push the branches in to a suitable holding shape now). If you find that your branches are getting too long and you want more spindly and smaller branches, then fold a single loop in half to create two loops and hence an extra branching. At the tips of the branches, flatten the looped wire out in to a single point to finish the job. Step 5. Back to those roots. We're going to follow a similar prescription to steps 3 and 4 for the roots. However, since they're the ends and don't have loops on already, I've looped them back on to the trunk in four groups. This serves to both thicken the lower trunk and give more stability to the tree. The roots don't have as many bifurcations (if at all) compared to the branches. Once you've twisted your roots in to place, you should stand your tree upright on the base that you're going to use. Does it balance? If not, you might like to re-arrange some of the branches and roots to alter the centre of gravity (unless you want some wind-swept trees, of course, which would be perfectly understandable). Step 6. This is the messy part that also takes a while. Scoop a liberal amount of filler in to your tub. Add a small amount of water to it. Using your lollipop sticks, mix it up. You might want to add a few drops of paint to the mixture at this stage. But beware: since the mixture is white, you should add darker colours than you might initially think (In the pictures, I've used a combo of Catachan green, goblin green and black ink). The consistency you're after is slightly less thick than toothpaste (like viscous honey perhaps? ), smooth and without lumps in it. Using your wooden lolly poles, smear the mixture on to your tree's wire-frame. You want a relatively good coat (enough to hide the wire underneath), but you don't have to be too picky or coat it extremely evenly since the foliage will hide some of the less even portions later on, particularly toward the tips of the branches. Remember that real world trees come in all shapes and sizes and don't get too hung up about splodges here and there. You can always drybrush it later if you like. I'll also note here that the filler can be used as a temporary "glue" to fix the tree to its base. It is not a strong bond in the slightest, so you should use superglue instead later (or use green stuff) once the filler has dried. Step 7. Once your coats are completely dry, we can apply the clump foliage. Since the filler is flexible, you should still be able to bend your branches in to new orientations. 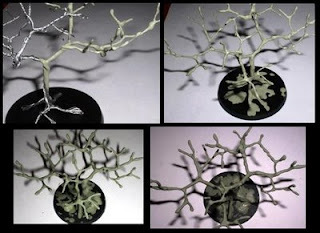 Use some white glue (PVA) and apply the clump foliage at the tops of the branches in whatever formation you like. Don't be afraid to "pinch" a pair of branch tips together to better hold a foliage clump in place. Step 8. To complete the process, add some flock and scenic additions to the base and you're pretty much done. I've never created the same tree twice, so don't worry if your tree doesn't look like mine! You can also do several trees at once depending on how much filler you mix up ready to use. In no time, you'll have whole forests growing up. My wife and sister-in-law have also been having a go at tree making. Truthfully, I can't tell their efforts apart from my own - so I reckon even beginners can obtain good results. Trees have gone from being a daunting challenge to something easy to produce for me. I hope you've enjoyed this tutorial and are inspired to give it a go. Further trees that resulted from using this method can be found here. 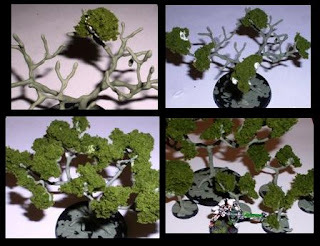 DSPainting blog had a great tutorial about making tree bases or area terrain outlines.Here's his tutorial. The two techniques combined would make for some great area terrain. The two methods combined would indeed make some great looking terrain in very little time. cheers! What length wire do you start out with generally? Hi David, I generally use lengths of between 40cm (16inch) to 60cm (24inch), depending on how high I want the final tree to be. The wire can always be folded in half twice at step 2 to create a thicker trunk at the expense of final tree height, so I'd suggest cutting a longer length is not a bad idea until you get a feel for it. Thanks for posting this tutorial. I used this wire technique to make vines climbing a building face for my basing contest entry. It worked extremely well, giving me the exact look I was trying to achieve. I wanted to keep some of the look of the wire twist, so used a very thin filler to "prime" the vine prior to installation. The "filler" I used was two coats of un-thinned white Gesso. For the first coat, I mixed three big drops of white Gesso and one small drop of brown ink and applied liberally. For the second coat, I added another drop of brown ink to the remainder and applied not so liberally. It was a great viney color, but one I lost in touching up parts of the vine I handled too often. To secure it to the building, I had twisted extensions from the wire in key locations (most done prior to priming) which I inserted into corresponding drilled holes on the building face. A little bit of glue in the hole to secure it, and added foliage hid the point very well. This securing method also provided the flexibility to add more wire "branches" so I could keep the main vine thin, but still have as many off-shoots as I wanted. For my work, I strayed from clump foliage and went for a leafy effect. I found a decorative paper punch with small leaves and actually punched a bunch out of tracing paper. Before punching, I painted the paper with a thin coat of Dark Angels Green on both sides. After individually applying the leaves, I touched them up with a Dark Angels Green / Yellow mix. It was very time consuming, so it is probably not a project I'd take on again soon. However, before I applied the leaves, the look of the "dead" vine on the building was very realistic. I may try the leafless method on a companion piece waiting in the wings. Hi 3BAC, Thanks for your detailed comment -- I appreciate the feedback and I'm really pleased to know that other people out there are getting the most out of this tutorial. I very much like the idea of using the punch holes - I'll have to give that a go!